Happy Older Persons Day - if you are celebrating. 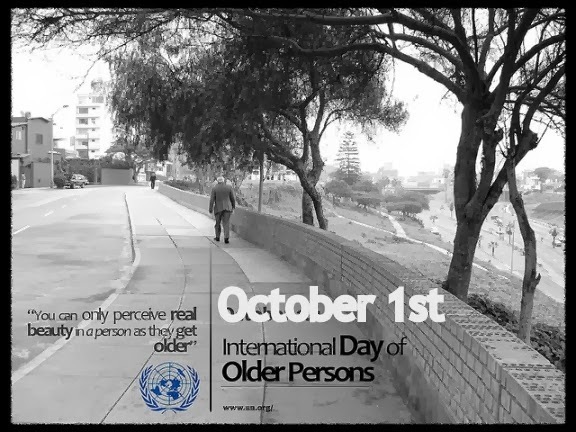 In December 1990 the United Nations General Assembly designated October 1 as International Day of Older Persons. 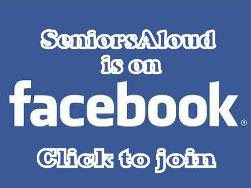 This year 2013 the theme is: "The future we want: what older persons are saying." So what do older people want? Find out here. As in past years, this day will probably pass quietly in Malaysia with few people aware of its significance. We celebrate Valentine's Day, Father's Day, Mother's Day, even Teacher's Day with gifts and special dinners, but Older Persons' Day? Never heard of it. Even if we have, who cares? Sad, isn't it, this apathy towards older people. 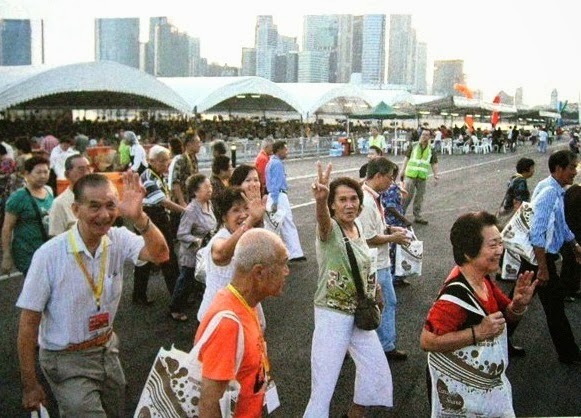 Senior citizens in Singapore enjoying a day outing. Today is supposed to be a day for us to acknowledge the contributions of older people. In countries such as Britain, Australia and Russia, the day is celebrated with a host of fun activities for senior citizens. It's their day and they take centre stage. It is also a day to raise awareness of the issues that affect older people in our society. Let me highlight a few of the challenges older people face. They are discriminated against when seeking re-employment. They have limited financial resources to cope with rising inflation and escalating health care costs. They live in cities that lack adequate elder-friendly facilities. The list goes on. The government and policy-makers in our country, for example, do not give equal priority to the problems that confront older people. Society as a whole view this demographic as 'unproductive', and therefore not worthy of investing money in. Philanthropists and companies doing CSR prefer to fund organizations looking after the welfare of children and animals. Old people are considered a 'lost' cause, with no ROI value. It explains why the majority of senior citizens clubs and NGOs have difficulty raising money to fund their programs. From public transport to housing, from healthcare to financial support, older people struggle to cope with living in a society that pays little attention to their needs. "By 2050, the number of older persons will be twice the number of children in developed countries, and the number of older persons in developing countries is expected to double. This trend will have profound effects on countries and individuals." Our numbers are growing rapidly. Just pause for a moment and think of the ramifications an ageing population will have on society, and the economy. How prepared is the government for this eventuality? I have posted this video a couple of times over the past two years. It deserves to be shared here yet again, and again till the message sinks in, till the urgency of the situation is felt by one and all. 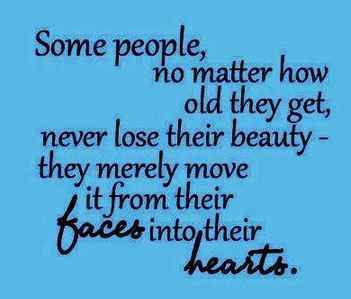 Ageing affects everyone of us. We all get there one day. will soon be a common sight in Japan. Japan and Singapore are already experiencing some of the effects. The Singapore government has spent millions on promoting active ageing and raising the fertility rate. Japan is coming up with innovative technology to help the elderly cope with activities of daily living. 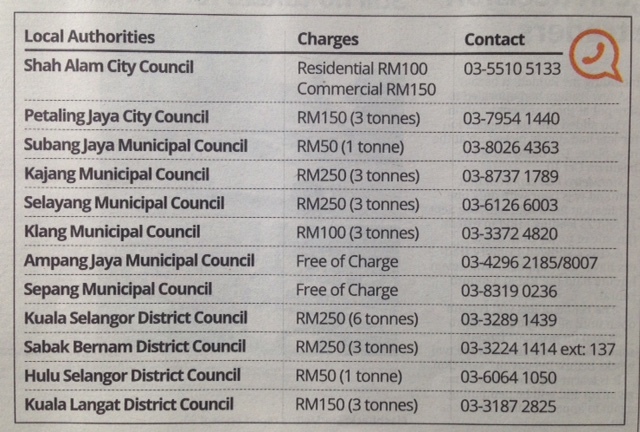 Before we know it, the year 2021 will be upon us here in Malaysia. According to our National Statistics Department, that is when Malaysia will join the ranks of ageing countries. 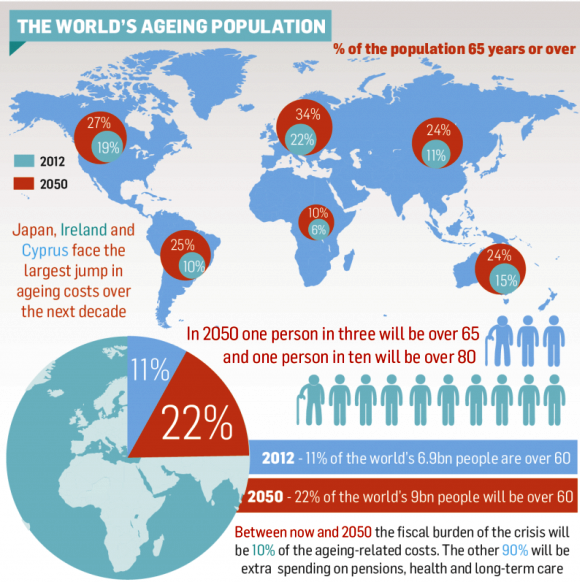 By then senior citizens (65 years and above) will make up 11.4% of the population, or 4.4 million people. That is three million more than in 2010! At this accelerated pace, and if the fertility rate doesn't go up in tandem, we will face the harsh reality of a shrinking working population having to support an ever growing older population. Conferences and seminars on population ageing issues are held in Malaysia from time to time. But as long as proposals are put forward but not implemented, these events bring little long term benefits for the older population. Check out the link to see what topics (and issues) will be covered. Registration is still open. My apologies, folks, for painting such a gloomy picture, especially on this Day of Older Persons. The future doesn't have to be this bleak for us, if we can help it, if the government can help it. Let's close on a more positive note with this video from HelpAge. A thoughtful post and very true. 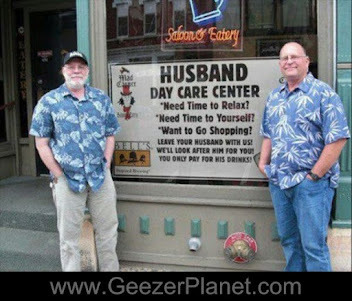 As one in the 65+ age bracket, I have only just given up working. Basically I was forced to as they kept asking more and more of me until I left. Actually, even though I don't have the luxuries I was used to, I don't regret it. I'm concentrating on my writing more now that I have the time to do so. It's really disappointing that there is no mention of the significance of this day in the print media. I have checked the English dailies. No wonder most people here are not aware that such a day exists.